AMC's television series The Walking Dead is a horror drama about an apocalyptic world overrun by flesh-eating zombies. 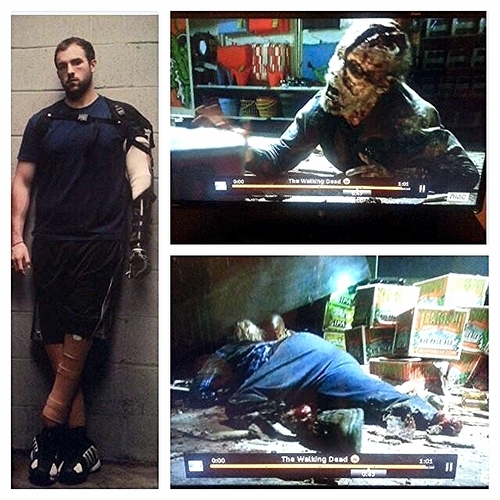 I was recruited to play the "Cracked Face Walker" on the premier episode of season four. This episode had the second highest rating in the five seasons on air. My featured part is located below. While attending the College of Charleston, I was honored to be the cover story for the school's magazine. This in-depth article covers several parts of my life and gives an accurate depiction of the obstacles, failures, and victories that I have experienced. The full article can be found by clicking on the link below. Mark Berry, Alfred Hall, and Terry Manier did a great job, and I am blessed to have made friends with them along the way. I will always look back on my time in Charleston fondly. Go Cougars! Here are a couple of newspaper clippings from the local papers. After my appearance on The Walking Dead, Fox News reporter Nikki Davis sat down with me for an interview about my time on the show. Watch the full interview on the video below.